After an impressive 5-0 start to the season, the Matadors have stumbled to an 8-5 record as they prepare for the Big West conference play. No. 12 CSUN will now begin the journey to etch their mark on Big West history. Next on the schedule is No. 1 ranked Long Beach State. Long Beach remains undefeated at 14-0 and has dropped just three sets on the year. The 49ers have notched impressive wins against Loyola-Chicago, Lewis, Concordia-Irvine and two against UCLA. All of which downed CSUN. “Long Beach runs a very fast offense, the fastest that I have seen,” Coach Jeff Campbell said. CSUN has struggled against ranked teams this season and remains 0-3 in these contests. However Long Beach will be the first ranked opponent to visit the Matadome this season where CSUN has won four of five. CSUN is 0-5 against ranked opponents. Campbell believes the team is coming up at the right time and playing better, the matches have just gotten tougher. CSUN’s last game was a five set loss to Concordia-Irvine who sweeps CSUN on the year. The game however featured incredible battling by both teams as well as numerous career high numbers for the CSUN. Arvis Greene, Dimitar Kalchev and Maciej Ptaszynski combined for 68 kills in the loss. Setter Sam Porter poured in a career-high 70 assists as well. This team has some surprising players step up this year as well as Porter. “[Ptaszynski] is probably the biggest surprise,” Campbell said. Ptaszynski has been improving over the season and was all over the leader board in Irvine. 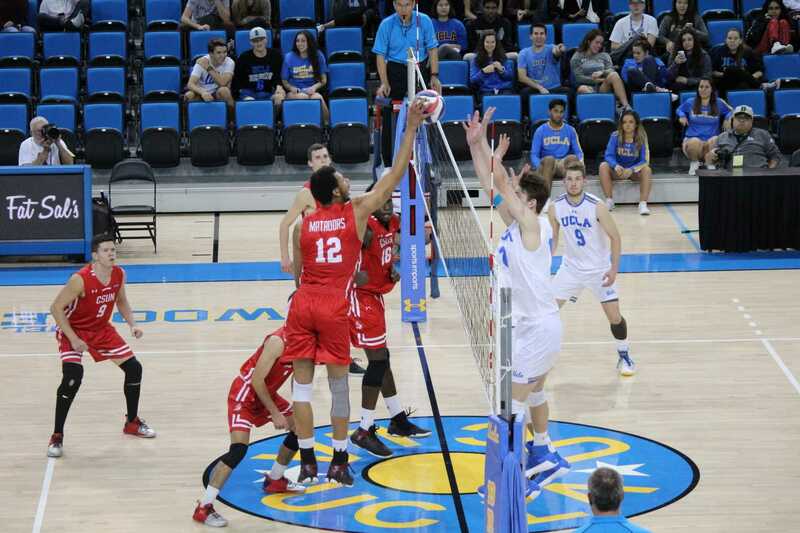 The outside hitter knocked down 18 kills, 12 digs, four blocks, three assists and an ace in Irvine. Ptaszynski heating up gives this team another weapon CSUN will happily utilize against Long Beach. Greene and Kalchev had led the way all year for CSUN. Now adding Ptaszynski to the mix with Josiah Byers, Ksawery Tomsia and Eric Chance really gives this team an option an every position. Greene leads the team with 163 kills followed by Kalchev with 145. The two will match up with two of Long Beach State’s five All-Americans in 2017. Kyle Ensing leads the Beach with 158 kills while TJ DeFalco directly follows with 154. The four are so close offensively they rank third through sixth in kills in the Big West. This will be the Matadors biggest test of the season and the squad’s first opportunity to finally face a ranked opponent at home. Long Beach visits CSUN Friday, Mar. 2 for game one of two meetings this weekend, the second being Sunday in Long Beach. The opening set goes up Friday at 7 p.m. in the Matadome.